The Lady and the Unicorn by Rumer Godden ~ 1938. This edition: Penguin, 1982. Paperback. ISBN: 0-14-00-5523-1. 189 pages. 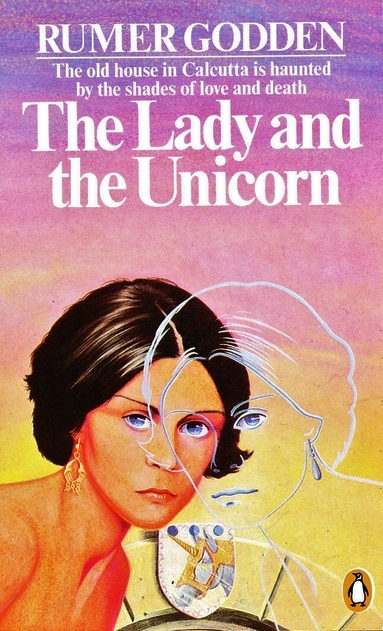 The Lady and the Unicorn follows a more traditional path, being generally a linear narrative tale, but it contains numerous elements which Godden was to use time and time again in her later, better known works. There are flashback sequences, ghostly visitations, an emotionally complex child character, brilliantly observed descriptive passages utilizing all five senses, great swaths of irony, and a sharp-eyed examination of the social mores of its time and setting, all wrapped up in a fatalistic what-happens-happens sort of shroud. To my secret delight, there is also a short reference to J.W. Dunne’s Theory of Time, which fascinated Godden all of her life and played a major role in two later novels, Take Three Tenses and China Court. Everything which comes later in Godden’s work is already here, serving to justify my opinion that Rumer Godden essentially wrote the same thing over and over throughout her long writing career, though her creative genius fleshed out the familiar skeleton of her One Big Idea to a varying but always lifelike form in each succesive novel. The feckless Lemarchant family, consisting of a widowed father, twin teenage sisters Belle and Rosa, little sister Blanche, and a maternal aunt, live in a decayed European-built mansion in an Eurasian district of 1930s’ Calcutta. Father is “Anglo”, Mother was Indian, and their offspring exist in a sort of societal limbo, being betwixt and between their two ancestral cultures while belonging to neither. When seventeen-year-old Belle, in the full throes of her burgeoning sexuality, makes eyes at the Catholic priest who has known her since babyhood, the twins are asked to leave their school. Father Ghezzi, trying to explain why he feels he must send them away for fear of their corrupting their peers, makes a passionate statement as to the difficulties facing those youth of mixed-race in India. Prophetic words, as Belle goes on to become the mistress of a wealthy dilettante, and Rosa in her turn falls in love with a newly arrived Englishman, a relationship which dooms her to disaster when his family catches scent of a potential complication in their son’s life and sends his childhood sweetheart out to India to entice him away from the apparently wicked half-caste girl of his latest infatuation. Ironically named Blanche, the dark-skinned “throwback” of the family, watches all of this from the shadows, while going through her own agonies of love and loss. An intriguing small novel, beautifully written and deeply poignant. I am not sure why it isn’t more widely known; it is as good as anything which comes after it, and so deserves a full place in this iconic writer’s canon. Here is the link to another review from Kat at Mirabile Dictu, which provides more details of the plot. Spring Always Comes by Elizabeth Cambridge ~ 1938. This edition: G.P. Putnam’s Sons, 1938. Hardcover. 312 pages. Life, Hilda thought, had played her a queer trick in embedding her, like a fly in amber, in a family in which she didn’t belong. Yet they were her children, only in the simple physical sense. Stretching out in bed with her hands behind her head, she thought that the fact was one likely to trouble nobody but herself. Her lively, inter-dependent family had no time to spare for the history of disappointment and reaccommodation that lay in their parents’ past. Hilda meets her husband Charles, a young and successful writer-poet, in the halcyon days before the Great War changed everything. After eagerly going off to fight, Charles has returned a changed man, not so much bitter as bemused and disappointed, and decidedly antiwar. He stops writing, and informs Hilda that he is going to go into the Church. This means a definite drop in the family standard of living; with three children and another soon to come, Hilda’s hands are full of the practicalities of making do on a junior cleric’s slender salary; she assumes things will stabilize and Charles get over his “momentary enthusiasm” for societal reform through religion and once again step into the spotlight of literary regard in which he had once basked. She is wrong. Charles is an idealist; he goes his own way ever and always, and Hilda follows, vaguely resentful, never losing her love for her husband but feeling at heart betrayed by it all turning out so differently than she had ever expected. The four children of the marriage are strong individuals, all with compelling motivations and desires. Cheerfully pragmatic James is at Oxford, with a promising literary future. Hyper-organized Margaret is deeply immersed in social work, carrying on her father’s compelling dedication to social reform. Intelligent and analytical Cecily is just finished school and is poised on the brink of deciding her career. Eighteen-year-old Jasmine, the youngest of the quartet, is reluctantly staying home until her brother is finished his education – there is only enough money to put towards one higher education at a time. She yearns to go out and do something, anything! to gain experience in the world to further her mostly secret ambition to be a writer. The family, though far from wealthy, are getting by reasonably well, based as they are in a rural parsonage, with Charles being held in high regard by his parishioners and his local social circle, which includes a number of people who remember and honor him for his long-ago literary success and his still-brilliant intellect. Then Charles dies, quite suddenly, from a neglected heart condition, which he has chosen not to divulge to his wife or children, and the family’s world unravels. No income, no more country home – the parsonage is needed for the next clergyman – and Hilda finds herself sharing a city apartment with Margaret and Jasmine, while James puts aside literary ambitions to go into a timber company’s office as a clerk, and Cecily takes on a post as a governess to tide herself over until she can start a job as a junior mistress at her old school. What happens to these five, their small adventures, their inner dilemmas, rewards and disappointments as they go about reinventing their lives after the death of Charles, core of the family in ways unsuspected until his loss, is the substance of this novel. And a good and substantial substance it is, as Elizabeth Cambridge draws us into each life in turn, depicting each personality and weaving a tapestry of individualism and inter-family relationship which leaves the reader deeply involved with each and every one of the characters. Not an important or a particularly dramatic novel, but a very relatable and accessibly philosophical one, and, as always with Cambridge, beautifully written. 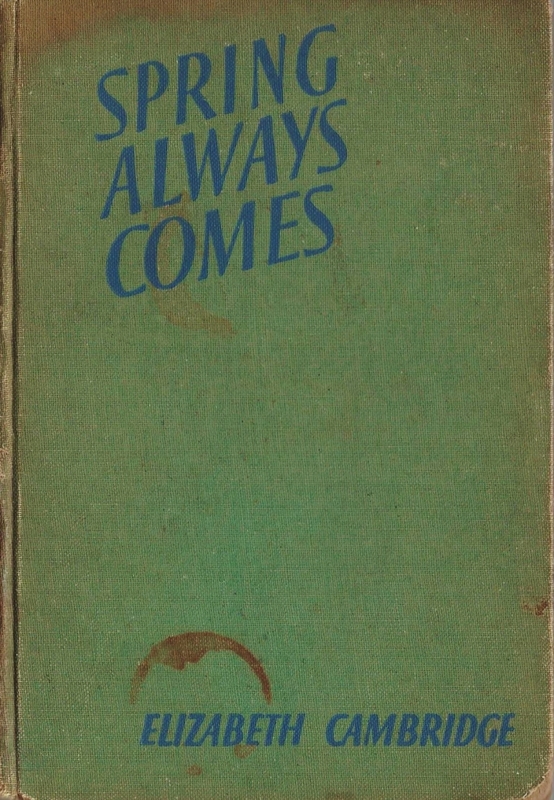 Elizabeth Cambridge wrote only seven published novels in her short career, with her greatest success being her 1934 debut novel, the autobiographical Hostages to Fortune. Her themes are generally domestic, she writes middle-aged women with particular insight, though all of her characterizations ring true. Elizabeth Cambridge died of tuberculosis in 1949, at the much too young age of 56. When reading her novels, one can’t help but regret that there are so few, and wonder what she would have accomplished had she lived longer. T he Joyful Delaneys by Hugh Walpole ~ 1938. This edition: Doubleday, Doran & Co., 1940. Hardcover. 401 pages. Lost the half point because of the too-convenient wrap up of the ending. A very minor complaint! What an enthralling read this was. Much better than expected. 2013 is going to be good reading year, if this omen is correct. The very first 2013 book, an ancient copy of one of Hugh Walpole’s London novels, The Joyful Delaneys, has been lurking on the edges of my awareness for at least ten years, possibly more. It was purchased at a library book sale, and its tattered condition, many interior stamps – Tulameen and Princeton had enthusiastic librarians! – and dog-eared and marked pages testify to its one-time popularity. This copy at least has been very well read. ‘Happy New Year!’ Fred Delaney said, standing in the doorway and smiling at the in-no-way beautiful person of Mr. Munden. He had switched on the electric light, and the illumination revealed Patrick Munden lying half in, half out of the bedclothes. No, he was not beautiful, his thin pointed face unshaven, his black hair spread about the pillow, his lean body protected from the cold by pyjamas, grey with blood-red stripes, by no means so fresh as they should be. The light pressed on Munden’s eyes and he opened them, stared wildly about him, then, cursing, buried his face in the pillow. ‘Happy New Year!’ Delaney said again. Promising, no? And the serendipitous timing! A book opening with New Years Day, being read by me on New Years Day! A complete and utter unplanned coincidence. Surrendering to the moment, I settled down to my suddenly-not-so-tedious-seeming read. And was rewarded by its general excellence, much more so than I deserved for my previous neglect. Why, oh why, hadn’t I read this one earlier?! Here’s a bit more, continuing the snippet from the first page. Munden raised his head and stared at Delaney. It was not a bad-looking face. The blue eyes were good, the forehead broad and clear, the chin finely pointed. He looked clever and peevish and hungry. He stretched himself, his open pyjama jacket showing a chest skeletonic and hairy. He rubbed his eyes with a hairy wrist. Delaney watched him with genial good temper. ‘Afraid I haven’t got such a thing,’ Delaney said, laughing. Delaney looked in the trousers and found half a crown, some coppers, a lipstick and a half-filled packet of cigarettes. He laid these things on the dressing-table. When the Stranger says: ‘What is the meaning of this city ? The answer, ultimately, is that the community wins over commerce, at least in this one instance, at least for a while. But there is a lot of ground to cover before this satisfactory state of affairs comes to pass. The Delaneys – Frederick and Meg, and grown children Stephen and Kitty – are the financially struggling owners of one of the last houses in their corner of London’s Mayfair – Shepherd Market – which has not been pulled down and built over or converted into modern flats. The house has been in the family two hundred and fifty years; this year, 1934, looks very much like it will see the Delaneys rousted from residence at last. A precarious existence is made possible by the renting of rooms to a number of similarly situated people – the random waifs and strays, the elderly and the dispossessed of the former upper classes who are now very much down on their luck. A pair of the Delaney tenants, Dodie and ‘Smoke’ Pullet, have exhausted every financial avenue, and are preparing to give notice. Smoke mulls over his bleak future possibilities with Fred, including that of the ultimate escape – suicide. …Unless something happened Smoke would do just as he said. And perhaps it would be the best thing for him. That was the real problem at the heart of the trouble. There was no place in this present world for the Smoke Pullets unless there was a World War again–then they would be admirable. Before 1914 they had played a very necessary part; they were a real need in English life and had been so for centuries. They had been the Squire and the Squire’s son; some property, possibly a seat in Parliament, beneficent, tyrannical, understanding in their country community, conforming, traditional, safe and sound. So it had been since the Wars of the Roses; from Agincourt 1415, say, until Serajevo 1914. And now, within the space of twenty years, they had become only a burden, and a wearisome burden at that. There was no future of any kind for Smoke and he without a leg which he had lost in the service of his country. Probably a nice gas-oven would be the best thing. But Fred Delaney can’t stay grim for long. Along with the pervasive background atmosphere of despair there are plenty of opportunities for love and laughter. He and Meg have long enjoyed what might be termed an “open” marriage, though Meg has not taken advantage of her freedom as her spouse most definitely has. The two deeply and truly love each other, but Fred has indulged his physical desires for other women regularly through the years. Meg knows this, and has made her peace with it, and now at long last is in her turn preparing to indulge in a little fling with an old flame from her youth who has re-entered her life, and who has confessed a lifelong infatuation with Meg, despite his own married state. Fred is currently pursuing a beautiful though frigid socialite; Kitty makes the acquaintance of a young man clerking in an antique shop; Stephen falls in love with the sixteen-year-old daughter of a dissipated gambler. 1934 promises to be an emotionally charged year in the tight-knit Delaney family enclave, even before their house woes escalate, which they soon do. Hugh Walpole skilfully weaves together these story strands and half a dozen others into this increasingly absorbing saga. His characters step off the page in living, breathing colour; his descriptions are better than photographs, including as they do sounds and smells and tastes and emotions as well as vivid visual descriptions; he skilfully plays on our feelings by including us as benign fellow voyeurs sharing a god’s-eye view of his fantastical world. I’ve only read a few other things by him, a book I’ve owned for some time, which I’ve just re-read, and which I’m intending to review in the next day or two, Hans Frost, plus a book of short stories which I can’t recall seeing around recently (must be packed away) called A Head in Green Bronze. Hugh Walpole wrote so many more! The Joyful Delaneys was very, very good. Amusing, thought-provoking, wonderfully evocative of the time and place. I was completely absorbed in the story, much to my surprise. I quite literally growled at any interruption of my rare reading times these past two days, and even sent the teens off to town in my precious car last night, with movie, snack and gas money liberally provided, so I could have a few hours of peace and quiet to finish the book off, even though I had to put aside some “real” work to do so. Anybody who will name a fictional dachshund “Endless” has my full approval. Hugh Walpole definitely goes onto the 2013 look-for list. One last note: the dustjacket image above is not from my own copy. Mine is a faded, stained and threadbare, green cloth-bound volume. I couldn’t bring myself to scan it – it’s too terribly tired.